Turkey banned a weekly rally staged since the mid-1990s by mothers protesting against the disappearance of their sons and relatives on the grounds that it had been exploited by a terror group, the interior minister said Monday. 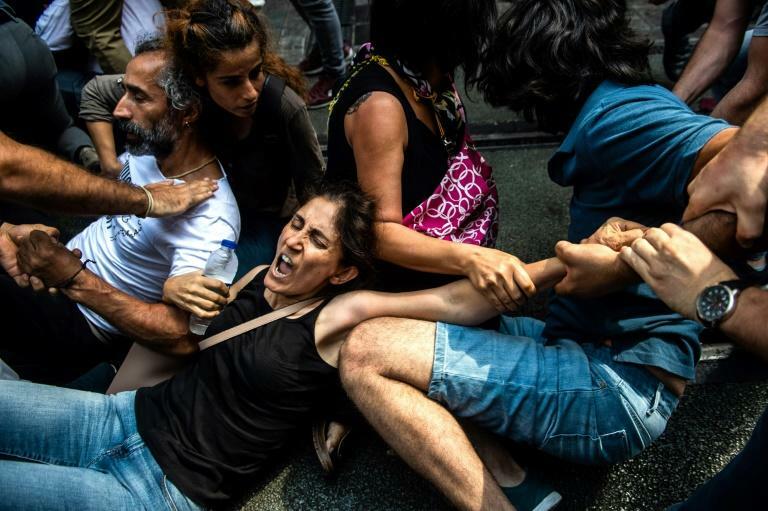 In an unexpected move, Turkish police used water cannon, tear gas and plastic bullets to disperse the 700th protest by the Saturday Mothers in central Istanbul this weekend, causing consternation among rights activists. Almost 50 people were detained, including leaders of the Saturday Mothers movement such as 82-year-old Emine Ocak, although all were later released. "We didn't let them (protest) because we want an end to this exploitation and deceit," Interior Minister Suleyman Soylu was quoted as saying by the state-run Anadolu news agency. "Should we have turned a blind eye to motherhood being abused by a terror organisation?" he added. Soylu did not specify further but Istanbul authorities had said that the rally was banned after calls to attend were made through social media channels linked to the outlawed Kurdistan Workers Party (PKK). The protest, held every Saturday since May 27, 1995, remembers the disappearance of relatives in the 1980s and 1990s -- allegedly at the hands of the state -- in one of modern Turkey's most turbulent periods. The disappearances happened at the peak of the PKK insurgency demanding self-rule in the Kurdish-dominated southeast. Tens of thousands have lost their lives in the conflict that began in 1984 and continues to this day. The country was also wracked by political instability and violence following the 1980 military coup, with many detained for political activism. Activists say the state has never properly investigated the fate of those who disappeared after being detained by the authorities. The Saturday Mothers group were unable to hold their protests from 1999 to 2009 due to repeated police interventions but they then resumed and Saturday was the first time in recent years that officers stepped in. The rally's forceful dispersion came two months after President Recep Tayyip Erdogan won a new mandate with enhanced powers, which activists fear will be used to squeeze freedom of expression in Turkey. The Saturday Mothers group is said to have been inspired by the Mothers of the Plaza de Mayo, a group of Argentinian mothers who hold rallies after their children disappeared during Argentina's military dictatorship.